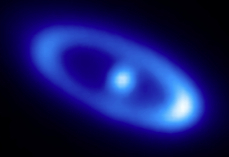 Protoplanetary disks form when a star is forming, during the gravitational collapse of a molecular cloud core. Much of the mass that eventually will end up on the star forming at the center will flow through the disk. Near the end of the star formation process, when the amount of new material falling down onto the disk, the accretion rate goes down, the disk becomes quieter. During this phase, we believe that planets are formed. During this phase, the shape of the disk is often flaring, so the surface is bowl-shaped. Radiation from the star can reach the surface in many places, so that the disks can be detected in scattered light. dustandgas.png\\ The disk is largely made of gas, but it also contains dust particles. The small dust particles stay suspended in the disk and can be present even at the surface of the disk. Larger grains sink down to the midplane, where they may start to grow and form planets. The disk surface is illuminated by the star, so it is warm and penetrated by energetic UV radiation. That radiation breaks up molecules, so that the surface layers are full of atoms and ions, but contain only few molecules. I am studying the structure and evolution of protoplanetary disks. We construct models of protoplanetary disks and use radiative transfer calculations to determine the temperatures distribution and the light emitted from the disk, so that these can be compared with observations. There is a wide range of temperatures present, and so the light is being emitted at many different wavelength. The inner parts of the disk shine in visible light. The further out we go, the longer the wavelength of the light becomes, so we get first near-infrared radiation with wavelenghts of a few micrometer, already invisible of the eye. Still further out, the disk emits mid- and far-infrared radiation, with wavelength of 10-60 micrometer or so. The coldest parts can be detected with radio telescopes. innerdisk.png\\ We are particularly interested in the inner disk regions. These regions are so hot that the dust particles start to evaporate, and the material becomes more transparent. The figure to the right (from Kama, Min, Dominik 2009, A&A 506,1199) shows this region, with the temperature shown in color. There is a region where the get quickly cold (dark area), and inside of this region there is an extended area where only a small amount of dust can survive. The "hole" in the disk is only the beginning. At later stages, when planets are forming, they can clear out a much bigger hole. Such disks give themselves away by only emitting a small amount of radiation at near-infrared wavelengths. Dust particles in protoplanetary disks collide, stick together, and grow in this way. Once aggregates have been formed, the result of collisions will depend on material properties, and on the speeds of collisions. 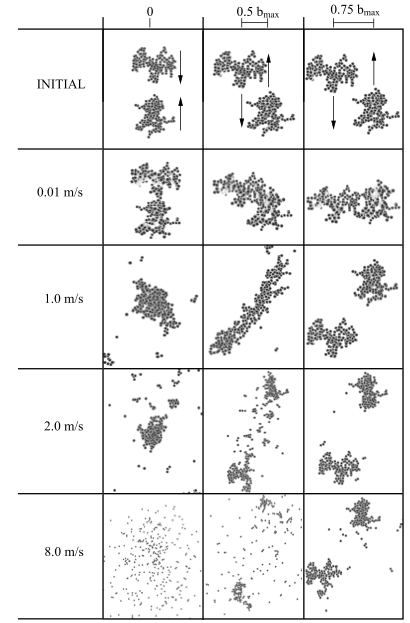 The figure to the right, taken from Paszun & Dominik (A&A 507, 1023), shows the results of a detailed calculation of dust aggregates, at different speeds. We see that at small speeds, aggregates stick, at intermediate velocities, they compress each other in central collisions, but they can also stretch each other by the effect of inertia in glancing collisions. At still higher velocities, destruction takes place and small grains are returned. Here a a few simulationmovies in 2D and 3D. Debris disks are formed when a planetary system has been build, and when there are regions in the system where not all the material has been collected to form big planets. In our own solar system, there are two main regions where this has been the case. The asteroid belt is the region between the planets Mars and Jupiter. Jupiter formed very quickly around the young sun, and it stirred up the region next to it so much that the growing bodies could no longer continue to grow. Collisions became violent, whenever two bodies would meet, destruction would follow. Still today, such collisions occur and produce a spray of dust grains. 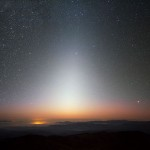 We can see these grains in a dark night, through reflected sun light above the horizon, as seen in the picture to the right. The other region where lots of material was left over is the Kuiper Belt, outside the orbit of planet Neptune. It seems that this is also the case in many other stars, because many stars show infrared radiation from this cold dust, long after the main protoplanetary disk has disappeared. Sometimes we can image this dust as well, the figure to the right shows one example. halostir.png\\ We can imagine that in the earliest phases of a planetary system, the production of debris is much more violent that it is now in our solar system, or in the debris disks around many stars. When planets are forming, they can actually move around in the system, disturb the orbits of leftover material and start the production of a lot of dust. Some young stars seem to have a torus of sphere shaped clouds of dust particles close to the star, and one way to produce such a structure would be to have a planet migrate through the planetesimal disk and stir up particles so much that they leave the plane of the planetary system and even fly over the poles of the star. The figure to the right, taken from Krijt & Dominik (A&A 531, A80), show how an inward-migrating planet can do just that.